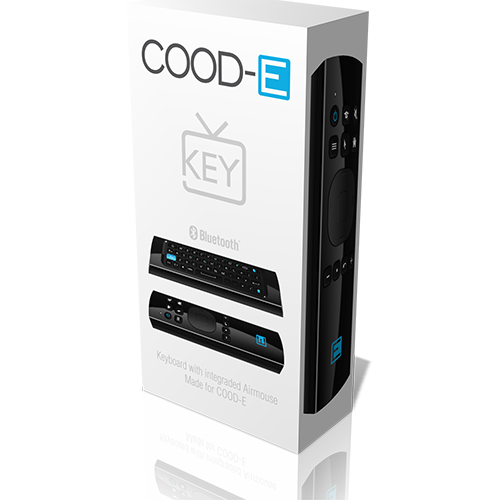 The COOD-E KEY will make your COOD-E TV experience even better! The COOD-E KEY makes it a lot easier to search for your favorite movies, songs and tv shows on your COOD-E TV. The front of the remote contains the IR control buttons and the air mouse button. The IR buttons work similar to the standard COOD-E remote but the functions can be changed with the learning button. For using the Bluetooth mode and the air mouse the keyboard needs to be paired to your COOD-E TV. This is very easy to do, just turn on the Bluetooth on you COOD-E TV, push two buttons on the remote and the keyboard will automatically be paired. When connected you can easily switch between IR mode, Bluetooth mode and the air mouse. The COOD-E Bluetooth Keyboard will give you full control over your COOD-E TV, the IR buttons can even be programmed to control your TV, home cinema receiver, or any other compatible device.